Does Descartes belong to metaphysics? What do we mean when we say "metaphysics"? These questions form the point of departure for Jean-Luc Marion's groundbreaking study of Cartesian thought. Analyses of Descartes' notion of the ego and his idea of God show that if Descartes represents the fullest example of metaphysics, he no less transgresses its limits. 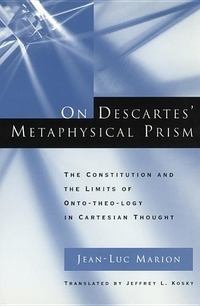 Writing as philosopher and historian of philosophy, Marion uses Heidegger's concept of metaphysics to interpret the Cartesian corpus--an interpretation strangely omitted from Heidegger's own history of philosophy. This interpretation complicates and deepens the Heideggerian concept of metaphysics, a concept that has dominated twentieth-century philosophy. Examinations of Descartes' predecessors (Aristotle, Augustine, Aquinas, and Suarez) and his successors (Leibniz, Spinoza, and Hegel) clarify the meaning of the Cartesian revolution in philosophy. Expertly translated by Jeffrey Kosky, this work will appeal to historians of philosophy, students of religion, and anyone interested in the genealogy of contemporary thought and its contradictions.